Uses: Borders, tubs, containers, pots, hard landscaping. Pruning: Tidy up as necessary. 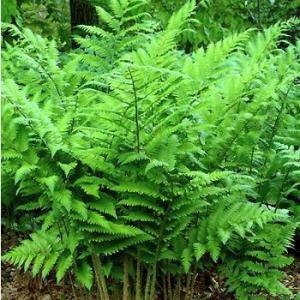 Dryopteris Goldiana ( Goldies Giant Wood Fern ) forms large clusters of graceful arching fronds. Dryopteris goldiana was named after Scottish botanist John Goldie who discovered it in North America. Plant in a shaded position in well drained soil. Once established it will reach a height of 100cm x spread 100cm. Foliage is deciduous. Plants supplied are in 9cm pots.